The Venetian and the Palazzo, two of the most visited Las Vegas hotels, are your hosts for the second annual Winter in Venice festival, with an ice skating rink, performances and much more. 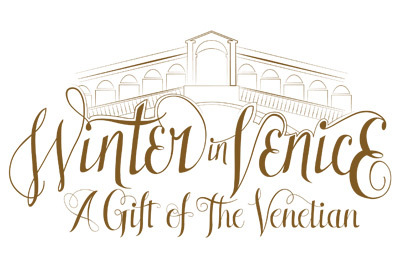 The Venetian and the Palazzo, two of the most visited Las Vegas hotels, are your hosts for the third annual Winter in Venice. On your next visit to the Strip, you'll discover a snowy wonderland filled with holiday charm in the heart of the desert. Get ready for 49 days of Italian-inspired seasonal attractions, a dream setting for a wintry vacation in one of the worlds most mesmerizing travel destinations. From November 18, 2013 through January 5, 2014, Winter in Venice combines the gondola-lined canals of Italy with traditional carols and festive style, crowned by a dazzling Las Vegas holiday light show every night of the festival. Beautiful winter parades, elaborate snow-inspired scenery, whimsical tree lighting ceremonies and a remarkable skating rink in Las Vegas create the ideal holiday travel destination surrounded by the bright lights and vibrant attractions of the city. A magical skating rink situated above the famous Grand Canal at The Venetian is a lovely spot for a romantic date or family fun in Las Vegas. Made out of an environmentally material known as ven-ICE, the skating rink doesn't require refrigeration or electricity, making it one of the most intriguing green initiatives at The Venetian. Spend an evening circling the rink while surrounded by strolling entertainers and an impressive Christmas tree. The famous Waterfall Gardens at The Palazzo will undergo a jaw-dropping winter transformation; glittering trees covered in ice and frost are part of picturesque scenery filled with poinsettias, hand-crafted statues and crystal ice ponds. Step into this wintry dreamland on your next Las Vegas vacation, an experience that will take your breath away. One of the main highlights of the festival is sure to be the Celtic Woman: Home for Christmas – The Symphony Tour. Guests will be able to enjoy the celestial voices of these multi-platinum Irish singing sensations live at the Venetian Theater. It's a 90 minute show featuring a whole host of holiday favorites to really get you in the festive spirit! Book your holiday stay at The Venetian or The Palazzo to fully experience Winter in Venice, among the most elaborate Las Vegas attractions. You'll discover winter-themed cocktails throughout bars, cafes and lounges, as well as exclusive holiday menus at some of the resorts' most popular restaurants. A nightly parade through both hotels features fun characters and entertainment, followed by a beautiful tree lighting ceremony at Doge's Palace and the spectacular Light of Venice 3D show. Don't miss a one-of-a-kind holiday vacation experience set on the fabulous Las Vegas Strip with Winter in Venice.